If you hate spam text messages as much as we do, and boy we do, then you’ll love this simple checklist on how to stop receiving them forever. What is a spam SMS? How do they get your number and how do they send? Any unsolicited/unwanted text message you receive is considered spam. You will generally have absolutely no idea who the message is from or why you received it. This is different from marketing messages you may have opted in to receive and can generally, easily opt out of (more on that in a bit). From a number you’re not familiar with (this may not always be spam, but it’s a good sign). From a company/institution that you would never normally hear from, or have never heard from, via text. Classic examples are a bank, the taxation department, a claims company, a lottery. They will have a link (which you should never, ever click on) and they’ll be driving you to click on it by joy; ‘To claim your prize click….’ or fear; ‘To stop legal proceedings click….’. Promoting something that’s too good to be true, remember it always is! Lack the ability to Opt Out or STOP, all marketing SMS messages by law should allow you to Opt Out/STOP. 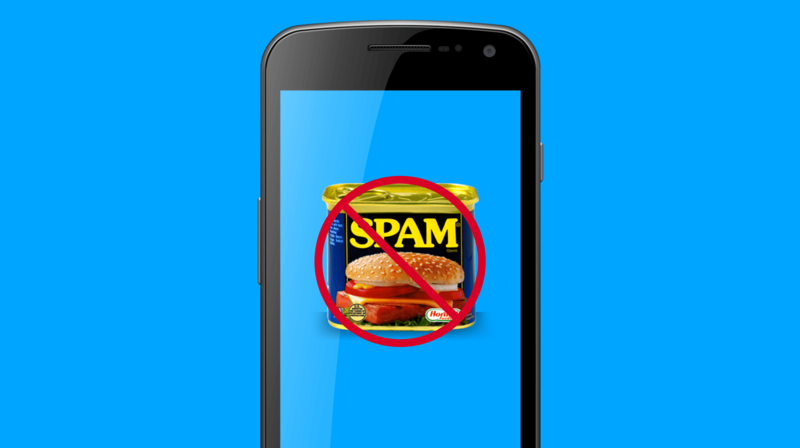 Generally, even if the text message is not for commercial gain, if it doesn’t have an Opt Out message it’s spam, but there are several reasons and instances an unsolicited message may not ‘legally’ be spam. NB Anti-spam laws, and their severity and how rigorously they are enforced, differ globally. There are several ways these unscrupulous companies get your number and some of them are actually legal. Legal list purchase; they’ve purchased a list of numbers from a company that you have knowingly shared your details with, but perhaps unknowingly checked, or not unchecked, the opt-in box that would say in fine text ‘You give us permission to share your data with other third-party companies….’. Illegal list purchase; they’ve purchased a list from a ‘colourful’ company that specialises in scraping the web for people’s mobile numbers and builds lists of people that have not opted in. Automatic Number Identification; in some countries when you call toll free numbers your number can be captured by a system called “Automatic Number Identification” or ANI. ANI automatically identifies and stores your number and matches it with other online digital markers associated with you. Randomly generated; technology today can generate gazillions of random mobile phone numbers in seconds. Most won’t work, but some will and yours might be one. With all spam companies, it’s a volume game where the old adage of ‘If you throw enough 💩some will stick’ being their strategy. These companies can be sending millions of spam SMS messages in one go and they only need a small % of these messages to be ‘successful’ for them to have made their money. So how do they send out all these messages, surely not a warehouse full of people smashing them out on mobile phones? Generally using online SMS Gateway software, where they’ll do bulk SMS campaigns. Now they may have created the software themselves or sadly use an actual company that has poor anti-spam policies in place. Here at ClickSend, even though we’re multi-channel business communications software, we have SMS at our core and businesses use us to do bulk SMS campaigns, but we have a very strict anti-spam policy, which starts upon sign up. 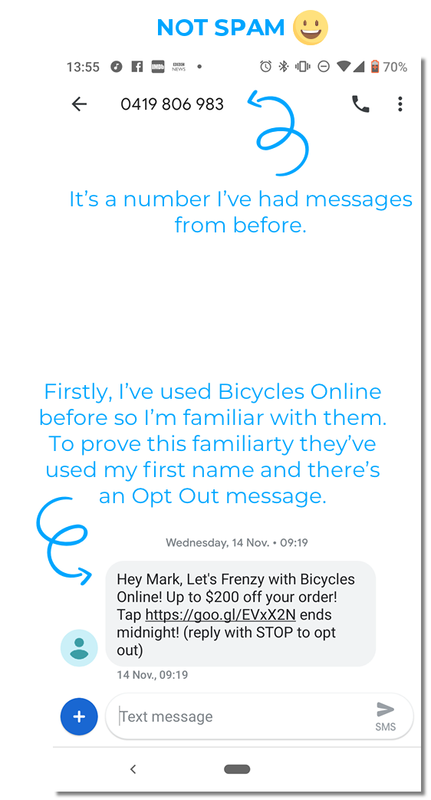 We can generally stop most ‘dodgy’ companies from even getting a single message out, and then we can stop messages immediately if they don’t conform to our stringent standards, like not having an Opt-Out in a message! Oh, and we also don’t allow the use of any bought lists, even if purchased legally. Don’t click on any links – NEVER CLICK THAT LINK! 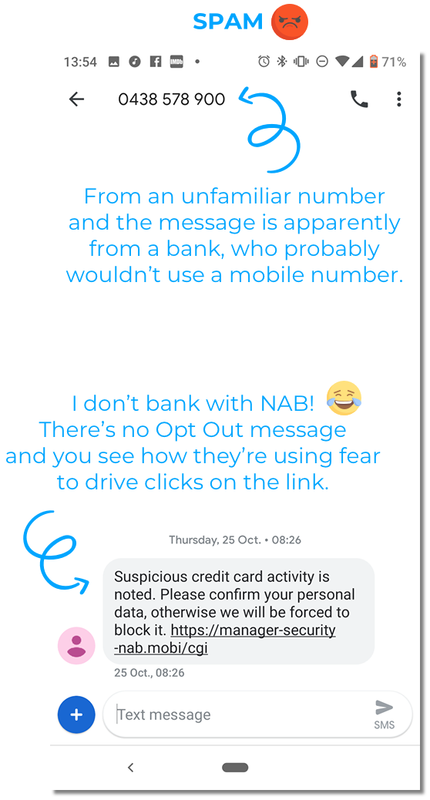 Do take a screen grab of any unwanted texts (just in case you need to refer to them if you have to take further action) then you can delete the text. Do report it or make a complaint to your relevant communications and media authority or telecoms ombudsman. In Australia, you can actually forward the text to the Australian Communications and Media Authority (ACMA) at 0429 999 888 (texts will cost the standard SMS rate). Now let’s look at some ways on how you can reduce and even stop (and even stop forever) the receiving of unsolicited/spam text messages. All Apple (IOS) or Android phones have the functionality that allows you to block numbers. These can change with software updates so it’s best to check via the means of Google, but here’s generally how it’s done. *A lot of these unscrupulous companies know you can easily block or report a number so they send them with no number attached, generally from a named sender instead. This is taken directly from https://support.apple.com/en-au/HT201229. When it’s not from a number the easiest way is to ring the number and cancel the call (it obviously wouldn’t have gone through) then go to your recent dialled list and block the number that way. The easiest way is to open the Messenger app, touch and hold the conversation you want to block, tap the circle with the line through it symbol in the top right (like this 🚫 but in black). A ‘Block & report spam’ message box appears, keep the check and click OK. The best method involves opening Messages, then choosing the conversation that contains the contact you want to block. From there, tap the More icon, select Block number, and toggle to check Delete conversation if you like. Then, tap OK.
For other Android handsets here’s a good article by Digital Trends that covers most. When it’s not from a number the Pixel phone allows you to do as above and on Samsung, the best way is to use the Block Phrase feature. 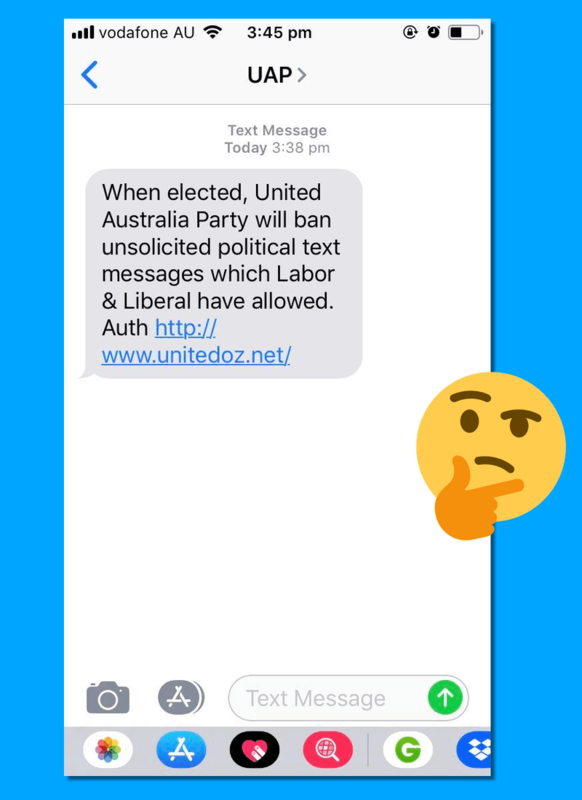 So if you received an unsolicited message from good old Clive Palmer and his UAP, like the example shown previously that’s been doing the rounds in Australia, you block the phrase ‘UAP’ and you won’t receive any more from this pesky political party (under the phrase UAP anyway). Here’s a good video on how to do it on a Samsung and most other handsets would be a variation of these two methods, but if in doubt Google is your friend. Now both these methods only stop you receiving them again from those numbers (or phrases) so how can you stop receiving any spam text messages forever? Use a call/text message blocking app. 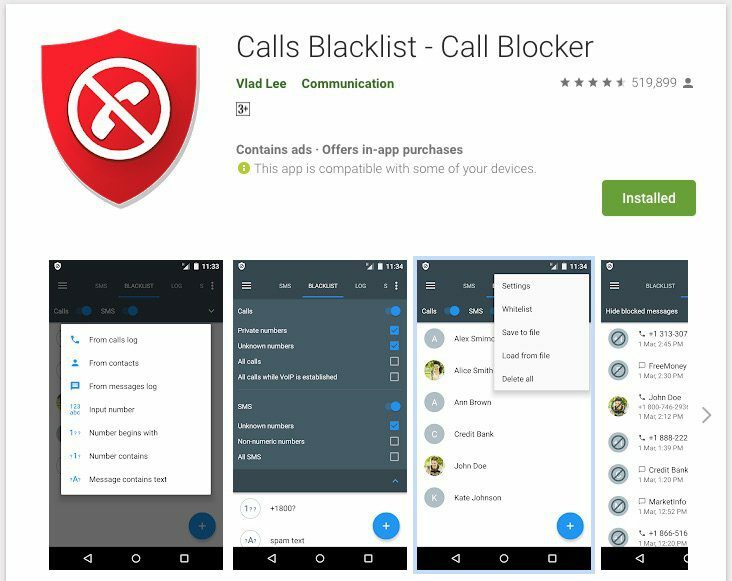 There’s a myriad of free call blocking apps that work to varying degrees, some will also push lots of adverts so do some research. So, if you want to get serious about never receiving unsolicited text messages (and calls) you’ll need to set the app to only allow messages and calls from numbers in your phone book. You can generally set things up so everything outside of your phonebook goes into a blacklist folder so you can look at them if you want, but you won’t hear (or see) any arrival notification from them. Now the drawback of this is that you may, for instance, get a text message from an old friend whose number you don’t have and don’t know about it until/unless you check your blacklist folder. So do that regularly. I personally use Calls Blacklist on my Pixel 3 Android phone downloaded via the Google Play Store, but I’m sure it’s on the App Store. It’s free, it’s very intuitive (you’ll have it up and running in minutes) and it doesn’t push ads outside of the app. So there you go hopefully, you know more about spam text messages and how to block them, and even forever!